From traveling to places we’ve always wanted to visit, to being more confident and owning our food choices. We’re excited to be sharing our adventures with you this year! Diets are out, confidence is in! With Kellogg Special K® food and snacks, it’s easier than ever to juggle work, parenthood, and personal time, giving you fuel for your on-the-go lifestyle. From Special K’s Protein line of bars, bites, and cereals, to their Nourish line of wholesome ingredients, you can feel confident giving your body what it needs, when it needs it. You have a choice in what you eat, so however you eat it, own it! Take advantage of this awesome deal to try delicious varieties, like the Special K Nourish Coconut Cranberry Almond cereal. Who can say no to that? 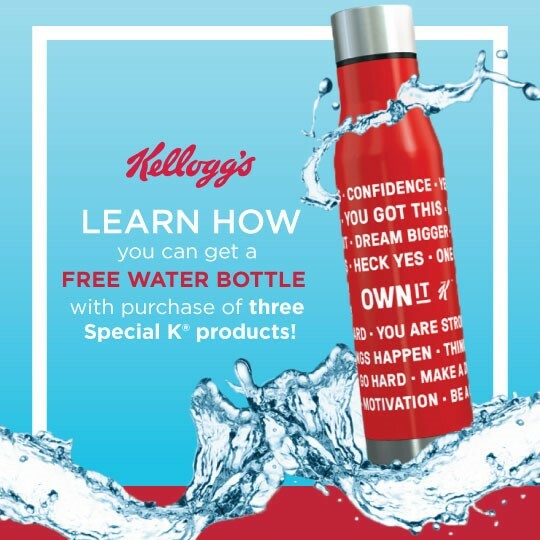 Plus, when you purchase any combination of three participating Special K products between 11/1/17 and 6/1/18, you can get a free water bottle with an empowerment message on it through Kellogg Family Rewards! Learn about the details here! To find out more about Kellogg Family Rewards, check them out here! And don’t forget to follow Special K socially on Facebook and Instagram for more inspiration on how you can Own It this year!